Best of Eastern European getaway. 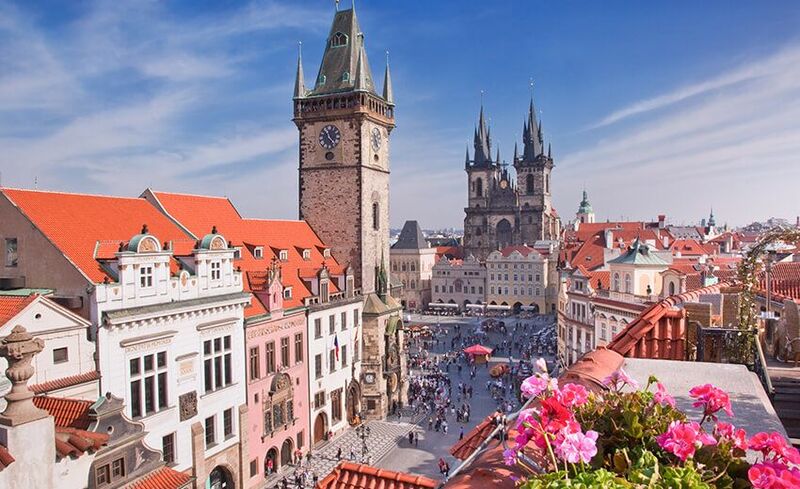 Visit cities of Prague and Bratislava. Understand European history in its castles and old bridges. No hidden charges. Discover the secrets of Eastern Europe. From castles, cathedrals and churches to mouthwatering food and spectacular landscapes, there is so much to see and delight in on this tour. 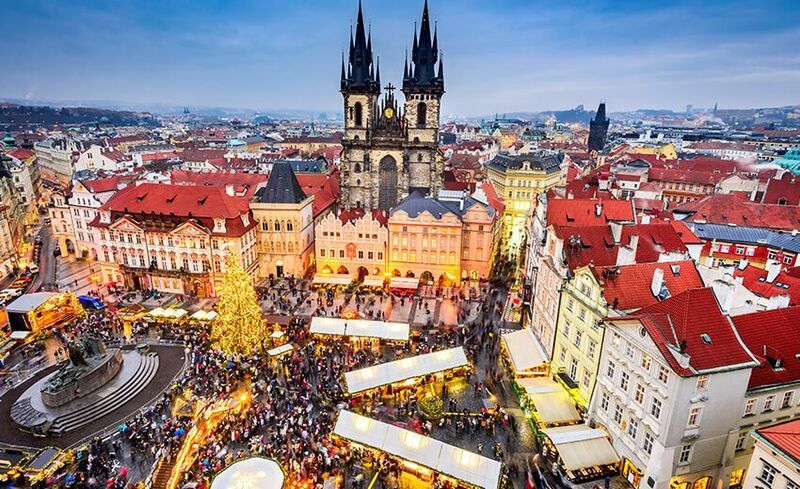 Your holiday begins in the city of Prague, capital of Czech Republic, a city known for its Castle, Charles Bridge and the Giant Astronomical Clock. The history of the city can be seen in every stone, every wall and as you walk through the Old Town, you become one with the city. 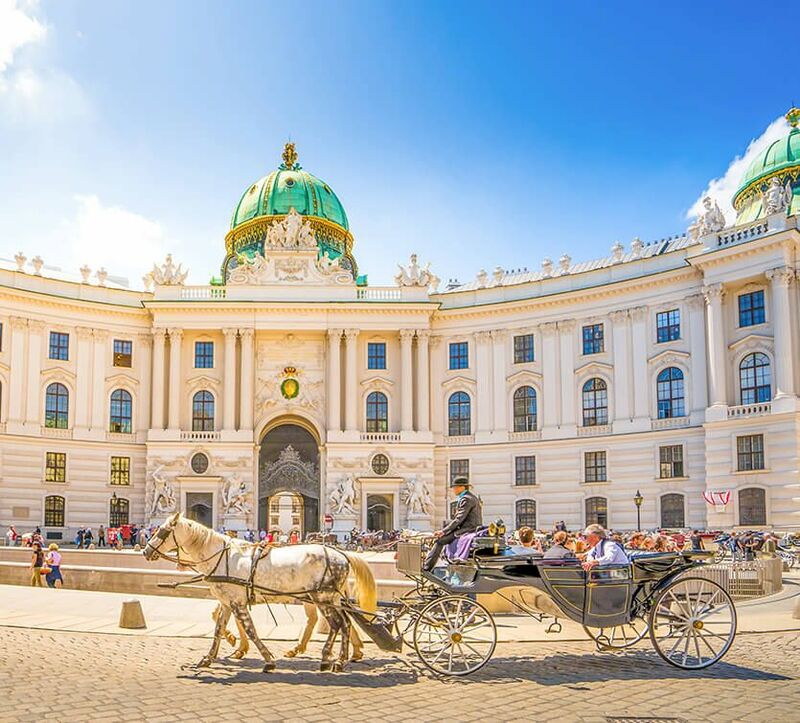 From the history of Prague, dive into the musical scene of Vienna, Austria, explore majestic palaces and vibrant markets. Immerse in the café-culture of Vienna and enjoy in its culinary delights. Take in an musical or two before continuing to Budapest, Hungary for another fascinating tour of its castles and hot baths. Spice up your stay with paprika-tossed goulash, a hot favourite and unwind on a cruise on the Danube. Party till you drop in Budapest’s famed clubs and then proceed to your last destination, Bratislava, capital of Slovakia, identifiable with its red and white castle sitting atop a hill overlooking the river Danube, go statue hunting around the city while enjoying a delicious gelato. Round off your trip with a picture with Cumil the Workman, Bratislava’s most famous Peeper. 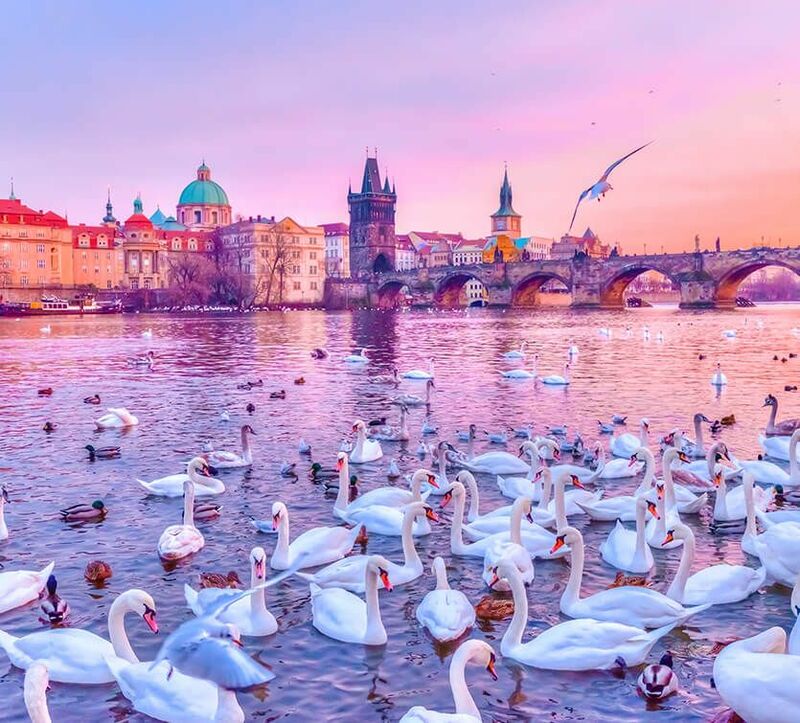 Welcome to the Bohemian city of Prague. Land at the airport, meet and greet your travel mates and tour manager followed a light pick-me-up breakfast and free time to freshen up . Later proceed on a guided walking sightseeing of the city followed by time on your own for lunch and afternoon hotel check-in. 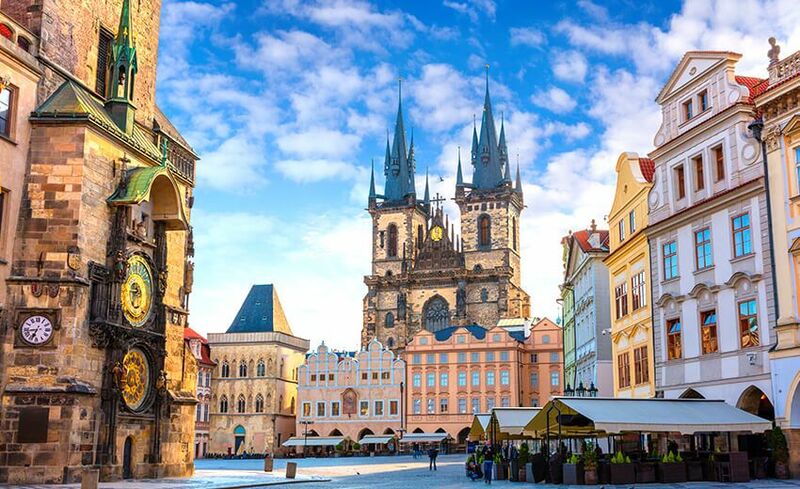 The walking tour explores the city’s finest such as the Prague castle; a complex of the 9th-century building, official residence of the President of the Czech Republic and St. Vitus Cathedral dominating the skyline of the city. 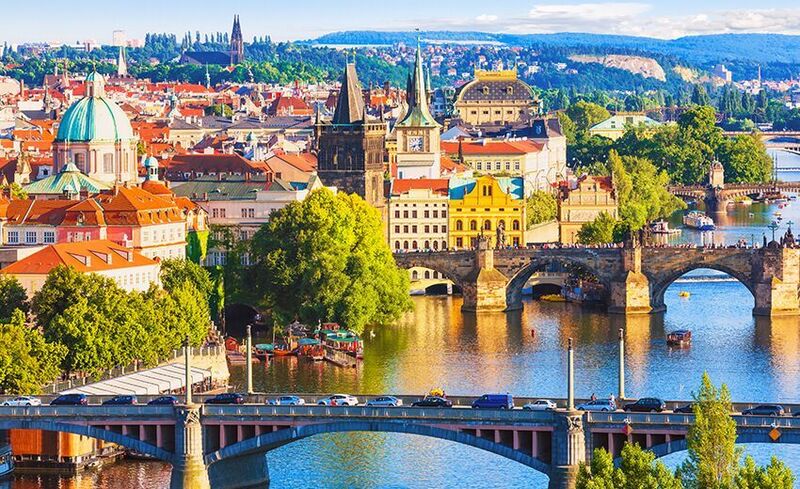 Walk on to Lesser Town located past the Vltava River, clusters of brick red-roofed houses embodying fairytale charm. Church of Our Lady Victorious, home of the famous Child Jesus statue called the Infant Jesus of Prague, passing by Charles Bridge a historic landmark crossing the Vltava river and Saint Nicholas church of Baroque style influence. 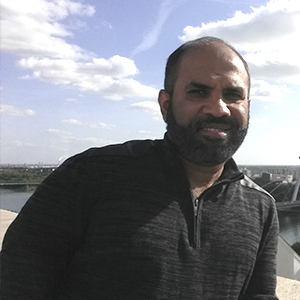 Explore Castle district with amazing views of the city. 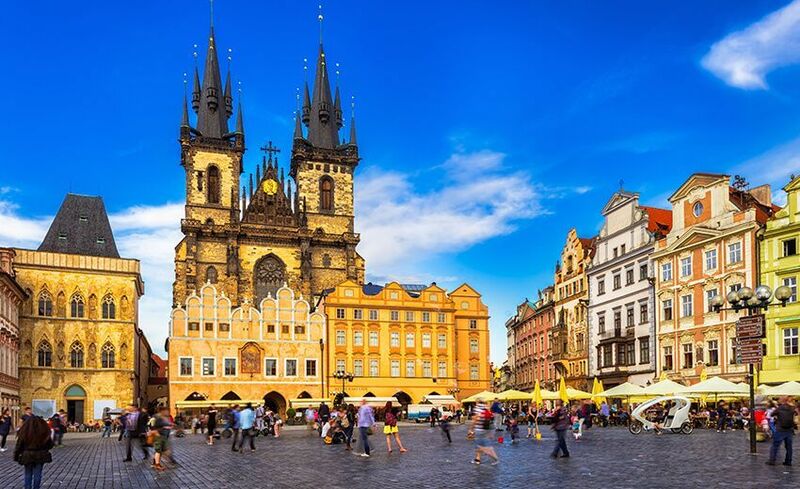 Last stop of your walking tour is at Old town square with “Prague orloj” the phenomenal astronomical clock. This medieval structure uses special mechanism to display planetary and zodiac positions. Overnight in Prague. Start the day with a good breakfast. Join in on the exciting full day to Karlovy Vary with a funicular ride, Diana Observation Tower and Folklore Dinner . Karlovy Vary is a popular spa town in the west Bohemia region and the second most visited place in the Czech Republic. Meet your local guide and proceed for a walking tour in the heart of a forested valley, to see numerous thermal springs and experience grand & impressive colonnade dispensing purified water from the natural thermal springs known to possess medicinal benefits. Next, ride the funicular to the top of Diana Observation Platform. Board the funicular and begin a steep yet entertaining journey uphill. View a mere trailer of the lush greenery awaiting the top on this ride. Once you reach the top, strep on the platform and be completely mesmerized by the view. Spot the town of Karlovy Vary resembling a perfect portrait of sorts from above and the acres of forest encircling the beautiful town. Enjoy an evening with traditional Czech Folklore show and dance along with dinner that lasts about 2.5-hrs. Overnight in Prague. Dig-in to the ready breakfast buffet after which checkout from the hotel. Sit back and enjoy your eye pleasing drive to Vienna. Distance Covered: 340KM Welcome to Vienna, proceed to the hotel for check-in. In the evening, enjoy dinner and dialogue with your acquaintances turned friends. Overnight in Vienna. Day 4 Guided City Tour, Vienna. Wake up to a ready breakfast buffet followed by a guided city tour of Vienna comprising of Ringstrasse, Vienna’s grand and most beautiful boulevard, the State Opera, the Museums of Fine Art and Natural History, Parliament building, Burgtheater (National Theatre), City Hall and University, the exquisite baroque Schonbrunn Palace with over 1,441 rooms and Belvedere Palace home to the worlds largest collection of popular Viennese artist Gustav Klimt. Later proceed to one of the oldest markets in town, Naschmarkt for lunch and free time. Stroll down the pathways encountering more than 100 food stalls, boutiques and restaurants. Overnight in Vienna. Wake up to a hot breakfast buffet and depart on a lovely drive to Budapest, Hungary. Arrive at the hotel and check-in. Distance covered: 243KM In the evening, partake in the optional tour to an awe-striking spectacle at the Hungarian Horse Show, a 45-minutes performance of horse shows & archer, with the Puszta-five as the finale; the horseman riding 5 horses at the same time. 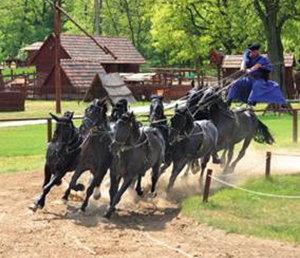 Visit the World Champion’s Museum & stable of the champion horses, experience the ride on old Hungarian horse carts from the forest to the farm. Finally, proceed to your dinner of authentic Hungarian cuisine with gypsy music and folklore dance. Overnight in Budapest. 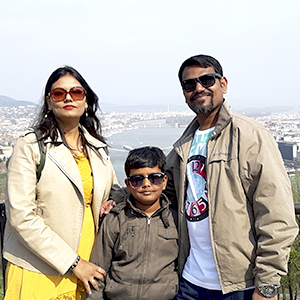 Begin the day with the most important meal followed by an extensive city tour inclusive of walking and drive of the Twin cities Buda & Pest with an expert local guide. 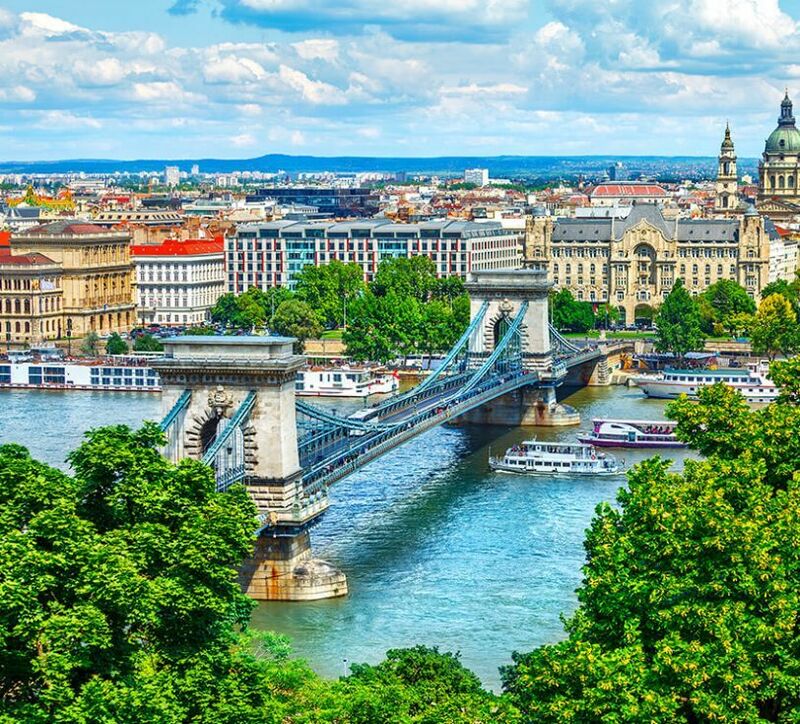 Explore famous attractions such as Chain bridge; a suspension bridge which connect its hilly region of Buda and flat district of Pest. 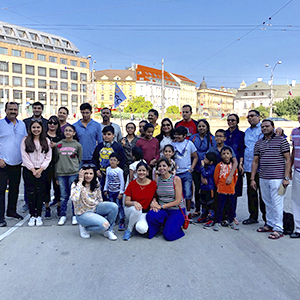 Cross Heroes’ Square and City Park, Vajdahynyad Castle complex, Szechenyi bath house, Andrassy Blvd, Deak Square, Vorsomarthy Square, Danube Promenade, Gellert Hill and Citadel, Vigado, Royal Palace and Matthias Church. Fisherman’s Bastion a terrace in Neo-Romanesque located on the Buda bank, St. Stephen Basilica one of the largest church named after first Hungary’s king, Budapest Parliament one of Europe’s oldest legislative Building, Buda Castle the historical castle and palace complex of the Hungarian kings. 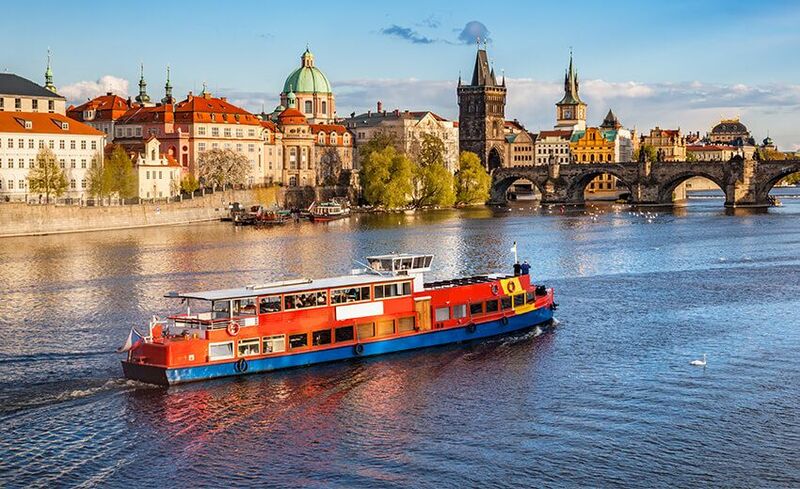 After city tour proceed to lunch and then Danube River to go on a scenic cruise along the waters. Overnight in Budapest. First thing on your agenda today is a delicious breakfast. 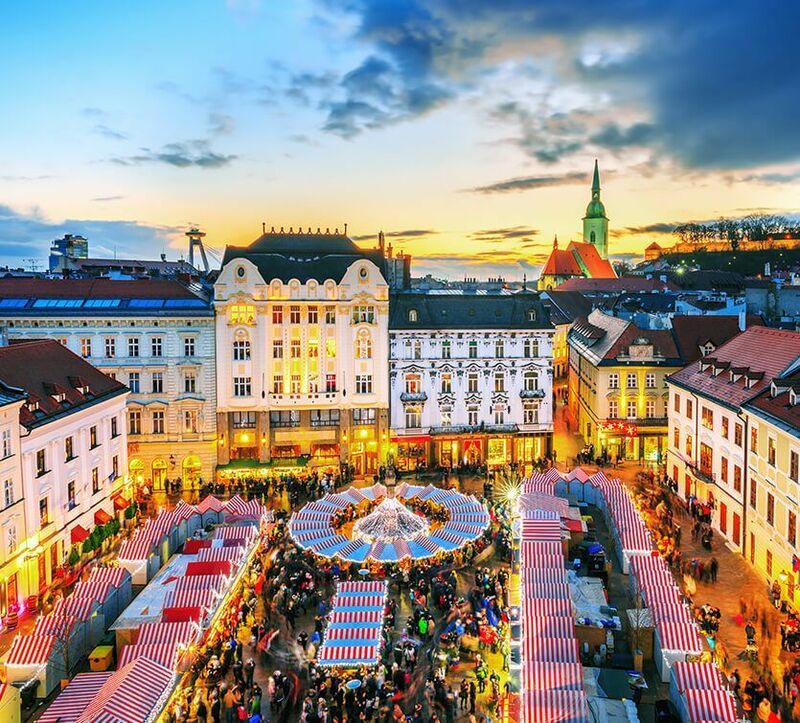 Check-out of your hotel and proceed for an entertaining ride to Bratislava, the capital of Slovakia. Upon arrival, explore the city of Bratislava. Cover sights of Slovak Philharmonic Hall, Slovak National Theatre – Opera, which is the oldest cultural institution of Slovakia, followed by Old Historical Town. 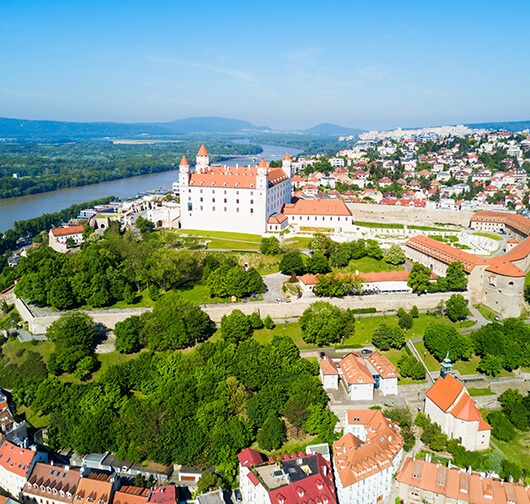 Your last stop will be Bratislava Castle, the main castle of Bratislava. Enjoy breathtaking views of the city from the castle. After the city tour, transfer to the hotel and check-in. Overnight in Bratislava. Thank you AFC for the fantastic trip to Prague, Vienna ,Budapest and Bratislava. The overall planning of the trip was perfect and everything went as planned. Hotel selection was good as we also discovered nearby sightseeing points. We would like to thank David and Vincent who guided us through out the journey. Both of them were very friendly and helpful. It was a mesmerizing trip and we took along lifetime memories. I would surely plan my next trip with AFC again.